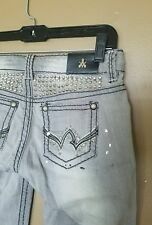 ANTIQUE RIVET Women's Jeans Sz 27 Low Rise Contrast Crystal Studded Pockets. Condition is Pre-owned. Measures waist 28”, inseam 31 1/2”. Shipped with USPS Priority Mail. Please check out our other listings for sale. We add new items daily to our store. Thanks. ANTIQUE RIVET. 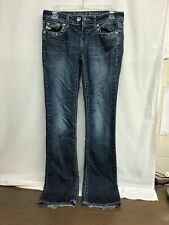 REALLY GREAT CLASSIC JEANS. NICE JEANS! These are our standard rates. Rates will be higher for large sizes or extra heavy jeans. DON'T LET THESE GREAT JEANS GET BY YOU! AS IS ONLY. Relaxed, Straight Denim Blue Jeans. Antique Rivet Size 26 Inseam 32. 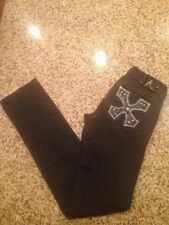 Studded, Stretch Low Rise. Good Pre-Owned Condition, Clean. 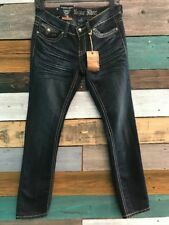 Womens Buckle Antique rivet Samantha straight leg low rise stretch jeans size 24 inseam 31 MSRP $85.00 that's more than 50% off original asking price! Celebrate the female form with a pair of jeans that caters to every curve. Size note: This item runs a size small. 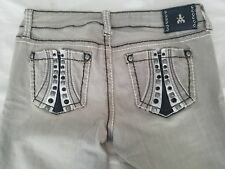 ANTIQUE RIVER JEANS. 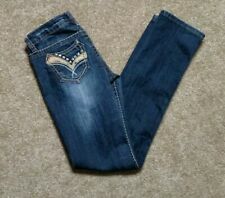 WOMAN'S SIZE 27. INSEAM: 31". WAIST: 15". ANTIQUE RIVET STUDDS & RHINESTONE. JEANS ARE IN MINT LOOKING CONDITION. LEG OPENING - 9". FRONT RISE - 7 1/2". 1224 in.26 in.27 in.28 in.29 in.30 in.